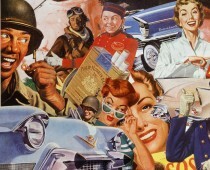 Mid Century America was the golden age of pesticides and it was love at first sight. Any thoughts about Earth Day and the environment lay far in the future. Thousands of new chemicals were put to use in new and amazing products, quickly tested and just as quickly rushed to market. Now you could get relief for your garden the modern, speedy way. Pesticides. They’re easy! They’re quick! They’re automatic! Why wait for old-fashioned organic nature to deal with pests, when there were new, fast working chemical compounds that went to work instantly. Pesticides belong- to the fun of living! 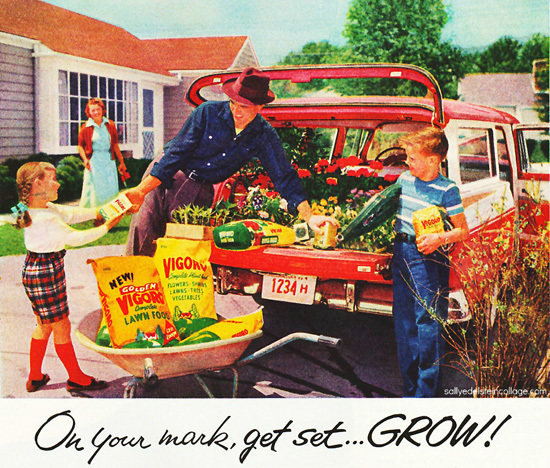 As spring exploded with a whoop and a holler, mid-century Americans cut loose in the great outdoors.Like clockwork, my father and I joined the swarm of suburban gardeners who would flock to their local garden center on Mothers Day. In garden centers all over Long Island, you would find row upon row of pretty, terra-cotta potted geraniums and fetching baskets overflowing with petunias, prominently displayed as offerings for Mothers Day. At the eleventh hour, they were lifesavers for those last-minute husbands and sons who in their consternation of what to get Mom, perfume or another cotton house coat, had thus far bought nothing. As soon as you entered the nursery, nostrils were bombarded with a blast of the earthy, musky, smell of peat moss, humus, and top soil, overpowered by the caustic odor of chemicals. Ah, breathe deeply of the invigorating scent of power –chlorynated hydrocarbons. My father was like a kid in a candy shop, his eyes bigger than our small suburban backyard. Dad dashed quickly down the nursery aisles, pushing past the plants, speeding by the spades, and totally ignoring the calibrated spreaders and wobbly wheelbarrows in his single-minded pursuit. What Dad looked forward to the most was the appearance of this springs new line of pesticides and petrochemicals. Chemicals as bright and fresh as spring itself. Aisle after aisle, choice after choice, shelves groaning under the weight of giant jugs of herbicides, boxes of insecticides, cans of fungicides and bottles of pesticides, all shapes and sizes, some dusts and pellets, others emulsions and granules. Miracle products all, with names such as Chlorodust, Toxiclor, Cook-Kill. The miraculous herbicide 2,4-D (dichlorophenoxyacetic acid) was hailed as a breakthrough garden product when it was released in the late 1940s. Like most suburbanites, dad knew there was no longer any excuse for a weedy lawn. He agonized over choice of weapons – should he go for the Martin Weed-Gun that came locked and loaded with a healthy supply of 2,4-D sufficient enough to kill ten thousands weeds or the nifty Killer Kane that squirted the same 2, 4-D herbicide killing weeds “as fast as you can walk.” To compound the decision there was the ever popular suburban favorite Weed-a Bomb, courtesy of the Thompson Chemical Corporation. Speaking of weapons, 2,4,D would later come in handy fighting the Vietnam War as the principal ingredient of the defoliant Agent Orange. Dad may have claimed he had great respect for Mothers in general, and Mom in particular, but the same couldn’t be said for Mother Nature. Mother Nature needed to be controlled. She was like a woman, fickle, stubborn but looking for a strong man to take control. Though loath to admit it, my father had Mother issues. Not unlike his own mother, he regarded Mother Nature sometimes as a friend, and sometimes as an enemy. He loved her, and resented her. Mother Nature was what he’d try to get away from, and yet he depended on her badly. With Mother Nature he could act out his impulses and decisions freely, unchecked. Formerly, Mother Nature, like his own mother, was more powerful than he. But now the balance had shifted. Man could control forces which at best rivaled and now seemed on the point of surpassing her. A clerk, dressed as a farmer in coveralls and a straw hat, was strolling around the nursery, spritzing samples of new herbicide 2,4,D for men to test. Dad splurged and bought 3 containers. Years later we would we learn it was associated with cancer, birth defects, kidney and liver damage. I planted some shrubs, it was not nearly as fun as these pictures portray! The lies are rampant about years ago. People of that generation live longer than today’s. Those chemicals are not at all as bad as they are portrayed. Rachael Carson was a liar and fraud. Today we proved it. Check the latest Harvard study on DDT. People were certainly more civil back then and cultured. Today kids commit murders, society is full of drugs, crime is astronomical and our children are being poisoned mentally both by the public school system and psychotropic drugs given to them like candy. Every rampage shooter was on or had been on these drugs like Ritalin and Prozac. Yes I would take years ago living with DDT R12 and lead any day over today. Truth be told. Don’t believe leftist BS. Ban the EPA.